Kenya's peace train is ready to roll. 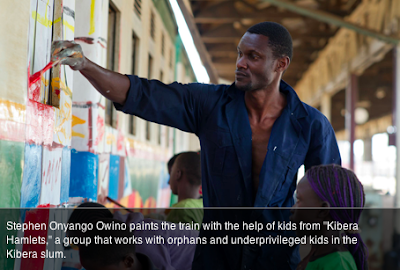 Kenyan graffiti artists received permission from the Rift Valley Railway to spray-paint a 10-car commuter train with peace messages and icons. It may be the first train in Africa with officially authorized graffiti. 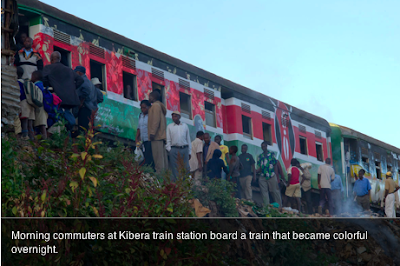 The train will travel through the massive Nairobi slum of Kibera, one of largest in Africa, where young gangs torched, looted and killed in the spasms of violence that followed the 2007 Kenyan presidential election. "What we're doing with the train here now, it's part of a civic education. 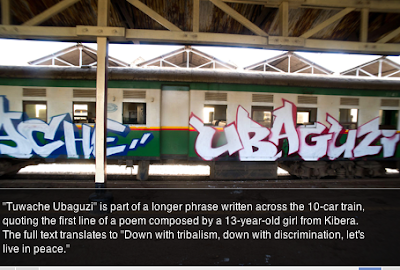 And a way to advertise peace," says Uhuru B, a 27-year-old graffiti artist. Many in Kenya take for granted that some level of violence will follow the upcoming presidential election on March 4. The question is: how bad will it get? Will it be comparable to the deadly but isolated skirmishes in the rural areas and poor districts, which Kenya saw in 1992 and 1997? Or will there again be countrywide outbreaks similar to those in 2007-08, which left more than 1,000 people dead and thousands more homeless? As Swift9, a 28-year-old graffiti-artist recalls: "It was chaos. Looting, fighting, the smell of smoke and sounds of screaming day and night. Mothers screaming — their kids are missing. People screaming, their houses going up in flames. And there's nothing you can do ... If you go outside you might get shot or beaten up by a rival gang." So why spray-paint a train? "Because the people have never seen anything like this," he says. "They'll definitely have to look at it. And they'll have to think about it during the voting time." Swift9 laughs about the night, two years ago, he nearly got arrested for breaking into the rail yard and trying to tag a train car. "Personally, I think it's every graffiti artist's dream to paint on a train," he says. "I've wanted to do this all of my life. But the last time I was here, it was impossible. We sneaked around but the guards were all over. We had to pretend we were taking photos for a school project." So how did the railway authority and graffiti artists – enemies as eternal as the Road Runner and Wile E. Coyote – decide to join forces? Their collaboration came out of another one, between the Kibera Walls for Peace and the Kibera Hamlets, two organizations that promote arts in Kibera. Kibera Walls For Peace is the brainchild of Joel Bergner, an American artist and educator from Brooklyn, who engaged kids from Kibera Hamlets to paint peace murals around Kibera. They approached the railway about letting them use one of the commuter trains as a canvas. It surely didn't hurt that authorities at Rift Valley Railway recall what happened after the previous election, when mobs of youth literally tore up the train tracks and sold them for scrap metal. Another graffiti artist, Bankslave, 27, was born in Kibera and still lives there. He sees dozens of official billboards around the city promoting peace, but says they don't have the power to speak to Kibera youth like street art can. In the last election, violence against his own house in Kibera was spared when looters recognized him as the guy who painted murals around the slums. Bankslave says this peace train will be riding long past the March 4 elections. "We're trying to make the train look beautiful so everyone likes it. It's not only about peace messages. I'm doing art as my career," he says. 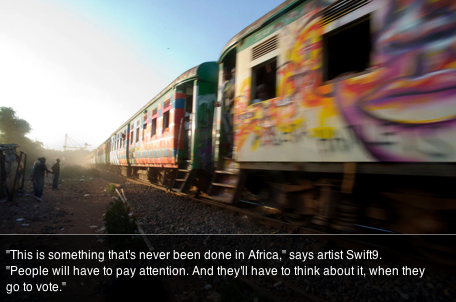 "In Kenya, not many people think about art as something you can earn [money] from. So I'm just telling people, '"If you have the talent, go ahead and do it. Do art.'"